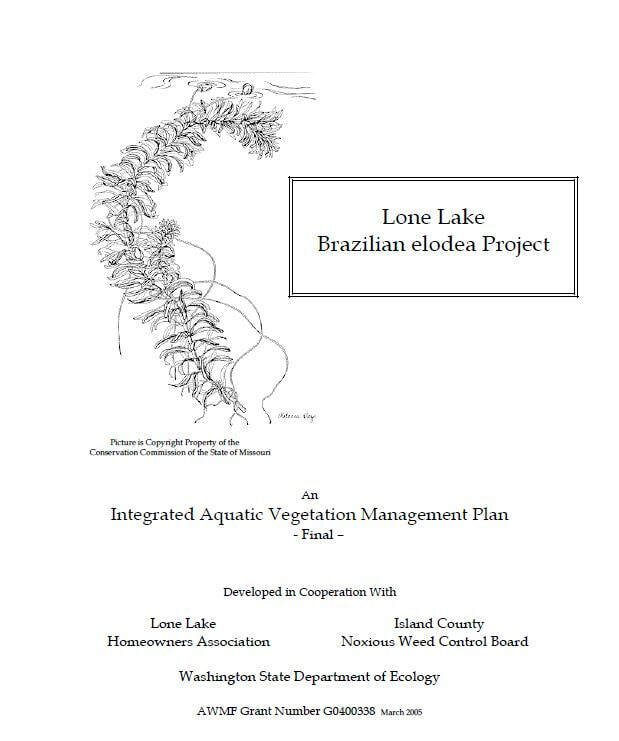 In July 2018, Whidbey Island Conservation District received grant funding from the WA Department of Ecology's Freshwater Algae Program to develop an Algae Management Plan for Lone Lake. The overall goal of this project is to produce a management plan focused on reducing nutrient loading to Lone Lake, allowing restoration of native aquatic vegetation and fish habitat, and improving water quality to restore and enhance recreational uses of the lake. The plan will provide a strategy to reduce the frequency and duration of toxigenic algae blooms in Lone Lake and prevent fish kills associated with dissolved oxygen depletion caused by algae bloom decomposition following a population crash. The project will involve multiple stakeholders in sampling and evaluation of nutrient loading reduction alternatives in order to set the stage for plan implementation, which will require an informed and engaged community to carry out lake management actions. On August 23, 2018, WICD hosted a public meeting at the Deer Lagoon Grange Hall to introduce the Lone Lake Algae Management Project. We had great attendance with about 25 people showing up to learn about the current grant-funded project, provide input, and ask questions. A PDF of the meeting presentation is available on this webpage and provides an excellent overview of this project. See "Lone Lake Algae Management Plan Project Information Meeting - August 23, 2018". Between 1996 and 2003, Lone Lake was invaded by Egeria densa, which reduced access and fish habitat quality. To address the aquatic weed problem, the Lone Lake Homeowners association, in cooperation with the Island County Noxious Weed Board and WA Department of Ecology, completed an Integrated Aquatic Vegetation Management Plan in 2005 that included use of herbicides and grass carp to control weeds. 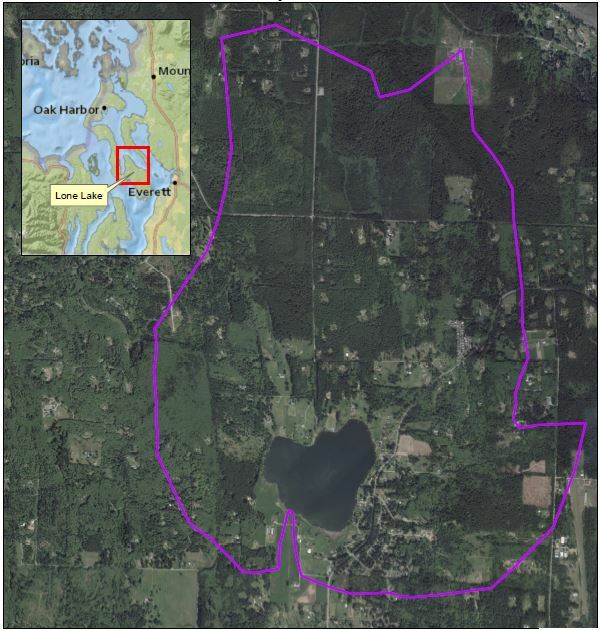 In the last decade, Whidbey Island Conservation District has worked with property owners around the lake to implement best management practices for managing livestock manure and runoff. Herbicide applications in 2005, 2006, and 2007 were followed by grass carp stocking in 2007 and 2009. These treatments resulted in eradication of submersed plants and a shift to a turbid, algae-dominated state with toxigenic algae blooms occuring since at least 2007. 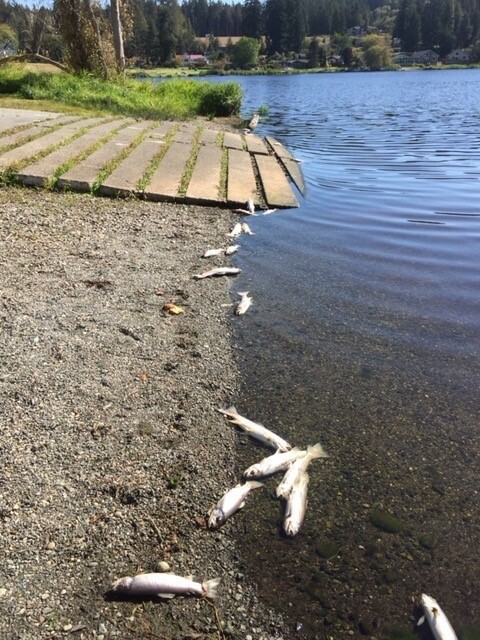 In 2016, the lake experienced a massive fish kill due to low dissolved oxygen concentration caused by the crash of a dense algae bloom. In 2017, although no fish kills were observed, dissolved oxygen concentrations less than 2 mg/L in surface water occurred on multiple days in mid to late August. Bottom water dissolved oxygen concentration was below 2 mg/L for most of August. In 2017, the lake was sampled on 10 days between July 6 and October 9; on eight of those days algal toxin concentrations (anatoxin and microcystin) exceeded state standards and forced lake closure. The closure prevented recreational swimming and other uses of the lake for much of the summer, seriously degraded fishing opportunities, and forced the local yacht club to move its youth and adult sailing classes, and the swimming leg of the Whidbey Island Triathlon to less favorable locations. The elimination of aquatic vegetation by herbicide and grass carp stocking caused substantial changes in lake chemistry. Total phosphorus in the lake average 0.06 mg/L in August and September from 1989 through 2007. In August and September 2008 and 2009, following the herbicide treatments and grass carp stocking, total phosphorus averaged 0.279 mg/L. Total nitrogen averaged 0.088 mg/L prior, and 2.07 mg/L after, chemical and grass carp treatment. The TN:TP ratio in the lake averaged 16.1 prior to treatment, and 7.3 after treatment, which suggests a shift to a nitrogen-limited state that benefits nitrogen-fixing, cyanobacteria. The decline in lake water quality and increasing frequency of toxic blooms has stimulated interest by many groups to enhance water quality and restore native vegetation and fish habitat. Fishing clubs have been particularly active. They initiated a bow-fishing program to remove grass carp from the lake to allow vegetation establishment. 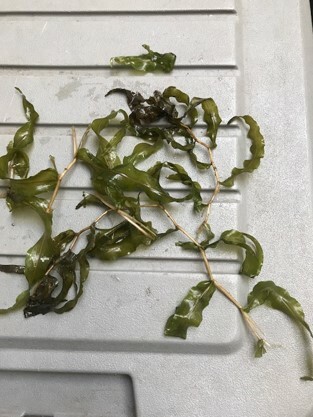 In 2017, 60 grass carp were removed from the lake, and in August and September 2017 a few stands of native pondweeds were established. Homeowners have also begun monitoring the lake for toxic blooms and reporting data to the county health department. For more information about Lone Lake Algae Management Project, please contact Matt Zupich.